You can't be pacifists in the face of genocidalists. Dr. John Morrow and the Muhammad covenants: “You can't be pacifists in the face of genocidalists. As Almighty Allah, subhanahu wa ta'ala says in al-Qur'an al-Karim: ‘O ye who believe! Stand out firmly for justice’ (4:135)”. 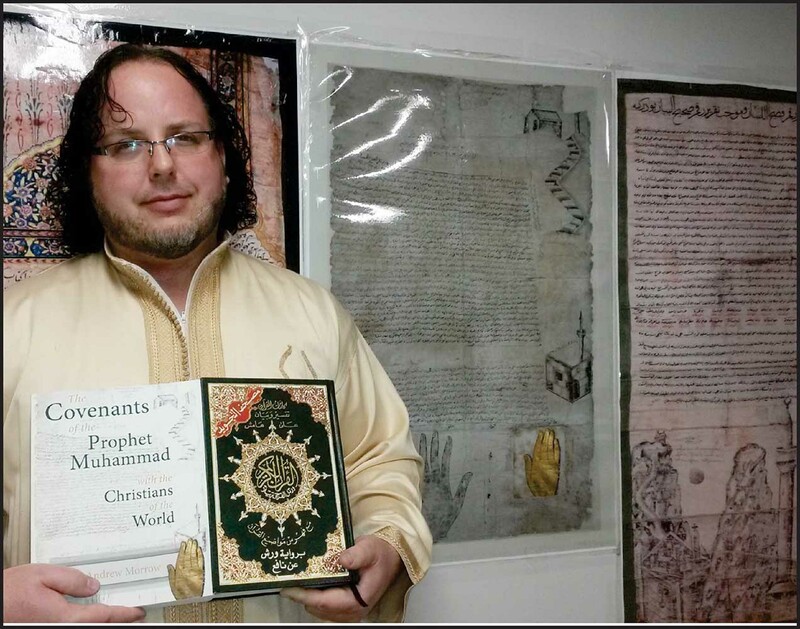 SHAFAQNA - On August 8, 2015, Dr John Morrow, an Islamic scholar and author of "The Covenants of the Prophet Muhammad with the Christians of the World" delivered an inspried speech at the World Muslim Congress in the US. Held under "Making true Islam acceptable", Dr Morrow offered his views and observations to the distinguished panel and attendees. "A 'udhu billahi min al-Shayhan al-rajim. Bismillah al-Rahman al-Rahim. Alhamdulillahi Rabb al-'alaman. Wa salatu wa salam 'ala ashraf al-mursalin: nabiyyina Muhammad al-Amin wa 'ala Alihi al-aahirin wa al-mas'uman. Wa ba'd. It is truly and unquestionably a great blessing to participate in the 2015 Muslim Congress and an unparalleled opportunity to address the timeless topic of making true Islam accessible. I commenced my Islamic Studies in the early 1980s. I started attending mosques in the Greater Toronto Area in the mid-1980s. I was very active in various communities in the 1990s. I moved to the States in 2001 and had contact with Muslim communities in Missouri, South Dakota, North Dakota, Minnesota, New Mexico, Texas, and Indiana for over a decade. I have also had the opportunity to travel and study throughout the Muslim world in places such as Morocco, Ghana, South Africa, Mauritius, India, Malaysia, Vietnam, China and Japan. I have worked with heritage Muslims and Muslim reverts from all walks of life, particularly Latinos and the people of African ancestry who inhabit the Americas. Over the past three decades I have seen a great deal of good. I have also seen a great deal of bad. I have spoken about my experiences. I have written about them. I can be brutal in my honesty. I am frank and forthcoming. I could easily write an entire book on the horrors I have endured. However, it is not my will or intent to subject you to a litany of complaints for, despite all of our shortcomings as Muslim communities, an enormous amount of progress has been made. Although many issues remain unresolved and many improvements remain to be made, I am tremendously proud at what Muslims have accomplished in the Western world over the past thirty years. I applaud you. But rather than praise you, let us praise Allah by sending our blessings on our beloved Prophet and his Holy Household. SALAWAT. How, then, do we make True Islam accessible? Accessible to whom? To non-Muslims or to Muslims? True Islam becomes accessible to Muslims to the degree that we study it and practice it, by reading the Qur'an, the whole Qur'an, and pondering its many meanings. True Islam becomes accessible to Muslims through the study and application of the traditional sources of Islam. As for making true Islam accessible to non-Muslims, this can only be done by example. Those who follow the examples of the Prophet Muhammad, his Companions, the Imams from Ahl al-Bayt, and of modern Western figures like Malcolm X, in the areas of decent behavior, community service and active defense of the oppressed, Muslim or otherwise, will manifest the light of Allah to all who encounter them, on the day when the sun shall rise in the west. If only we, as Muslims, embodied Islam, everything would fall into place. The Prophet, peace and blessings be upon him, did not simply preach, teach, and punish people. Nobody would have followed him. The Messenger of Allah, sallahu 'alayhi wa 'alihi wa sallam, practiced what he preached. He was the embodiment of ethics. He was the manifestation of morality. He was the pinnacle of justice. He was a perfect human being. He was the Qur'an walking and the Qur'an talking. What do New Muslims need? What do Muslim converts and reverts need? They need a community. They need a support system. I am not sure that many heritage Muslims comprehend this. I am not sure many heritage Muslims understand this. However, many, if not most New Muslims lose their families. They are rejected by their families. They lose their parents. They lose their siblings. They lose their relatives. They lose their spouses. And they even lose their children. This is not exceptional. This is normative. It may be a temporary situation. It may last years. It may last decades. In some cases, it may even last a lifetime. The Sunnis have understood this. I know many communities that provide a buddy system, a social support network, to help New Muslims. All I can say isalhamdulillah. More than anything, non-Muslims and New Muslims need Islam, true Islam, traditional Islam, and not the doctrines of this diabolical death cult known as Salafism, Wahhabism, and Takfirism. As a scholar who was trained by Ahl al-Sunnah, Ahl Allah, and Ahl al-Bayt, I have a very broad definition of what constitutes Orthodox Islam or Mainstream Islam. It is high time for traditional Sunnis, and by that, I mean Sunnis who follow the Sunnah, as opposed to the Umayyads; Sunnis who love, respect, and venerate Ahl al-Bayt; Sufis, and by that, I mean the true partisans of tasawwuf or 'irfan, who balance the shari'ah and the on the way to the haqiqah; and the Shi'ites, to join forces to promote traditional civilizational Islam to counter the propaganda that is being disseminated all over the world by the Salafis and Wahhabis. Evidently, there are many other things that are needed: 1) preachers should preach in the language of the land: you alienate people when speak exclusively in foreign languages; 2) we need high quality, authentic, Islamic literature, translated professionally and idiomatically; 3) we need a stronger presence in academia, in the media, in the arts, in all aspects of culture. But most importantly, we need to be engaged socially and politically. This is not the time for taqiyyah. You don't stick your head in the stand when heads are being chopped off. You don't keep a "low profile" when your people are being persecuted. You can't be pacifists in the face of genocidalists. As Almighty Allah, subhanahu wa ta'ala says in al-Qur'an al-Karim: "O ye who believe! Stand out firmly for justice" (4:135). If you don't care for black people? Why should they care for you? If you don't care for First Nations, Inuit, and Métis? Why should they care for you? If you don't care for the Christians of the East? Why should they care for you? Alhamdulillah, we are on the same page. Everyone on this panel is involved, in some form or fashion, in interfaith work. We work with various Muslim groups. We work with Christians. We work with Jewish people. Ya'ni: we work with fellow human beings: the sons and daughters of Adam, 'alayhi al-salaam. Never, ever, forget it: humanity comes first. You cannot respect Allah if you don't respect His Creation. If you don't believe that life is sacred, you don't deserve to live. You have denied your own existence and the Source of Existence. Please allow me to conclude with a few comments regarding the efforts in which I am involved. As most of you know, I am the author of The Covenants of the Prophet Muhammad with the Christians of the World. The book spawned the Covenants Initiative, conceived by Charles Upton, a movement by Muslims, for Muslims, which calls upon all Muslims to abide by the teachings of the Qur'an, the Sunnah, the Shari'ah, and the Covenants in their dealings with non-Muslims. This movement was well received. The book was endorsed by leading Muslim academics, along with leading Sunni, Shi'i, and Sufi scholars. Alhamdu wa shukralillah, I presented, and successfully defended, the Covenants of the Prophet Muhammad in the Middle East in the presence of Muftis from around the Muslim world. By the grace of God, we received the blessings of Pope Francis, the Holy Fathers from Mount Sinai, Patriarch Bartholomew and Patriarch Theophilos the Third. In Islam we had a tradition that was cultivated for over a thousand years called futuwwah or chivalry. Muslims used to compete with each other in nobility. Charles Upton, a Sufi scholar known as Sidi Akram, approached Christian leaders on behalf of the Covenants Initiative, asking, in all humility: "We are Muslims. How can we help?" The response was instantaneous. Bishop Francis Kalabat from the Chaldean Catholic Church responded and asked if the Covenants Initiative could promote a Genocide Initiative; namely, to pressure world leaders to describe the crimes being committed by ISIS, and others of their evil ilk, as acts of Religious Genocide. We acted immediately. The Genocide Initiative was picked up by Muslim and Christian media outlets around the world. Insha' Allah, I will be at the Islamic Center of Long Island on Friday, October 23rd, where I will be leading Friday prayers. On the Sunday, I will be speaking at the launch of their Interfaith Institute. Insha' Allah, I will be speaking at other venues as well. In the months to come, the Pave the Way Foundation will be organizing a press release and book signing at a major venue in New York City to promote the Covenants of The Prophet Muhammad with the Christians of the World, the Covenants Initiative, and the Genocide Initiative.Insha' Allah, I will be accompanied by other Muslims scholars, along with Christian and Jewish leaders. As Imam 'Ali, peace be upon him, said: "Be a friend of the oppressed and an enemy of the oppressors." We take Allah as our witness that we did not stand still in the face of genocide. We take Allah as our witness that we stood by the oppressed of the earth and by the oppressed of the earth we mean the Christians of the East, the Yazidis, the Ithna-Asharis, the 'Alawis, the Isma'ilis, the Sufis, and the traditional Sunnis: in short, anyone and everyone who opposes ISIS and the wickedness for which it stands. This is how da'wah is done. This is how we make true Islam accessible.